Why do we need any standards in sizes ,I think it would be so great if we create any size of Ad that we feel like, just in case – a place of 40×40 is available on the right side of the site, we will make up the Ad of the same size and fix it up there, so great we occupied the size perfectly , but No that’s not a right way !! Technically , by business perspective or by any way it won’t be right way to handle things at higher level . When online advertising started there were no standardization of sizes but with time the online industries started to grow and advance a lot there was a need to make standards of everything so that everyone remains on the same page with no confusion. With standardization of sizes , the advertiser’s didn’t have to design new ads for each site they advertised on , ans also publishers were able to have standard designs for their pages to accommodate specific ad dimensions.The standardization helped both advertiser and publisher , the publisher don’t have to worry for non standards ad sizes that don’t fit the design of their site , just like i gave example for 40×40 ad size. And for advertiser they just have to create one set of ads and know the most sites will be able to accommodate the ad dimension they use. This size is generally seen on top of the site or sometimes at the middle and bottom. Well known used size which is generally seen on every site. 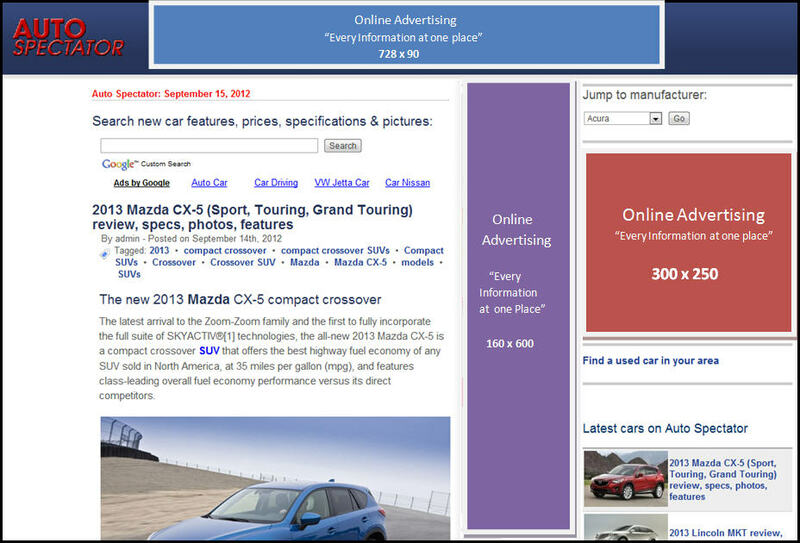 This standard size of Ad is seen at the left or right side of the webpage. 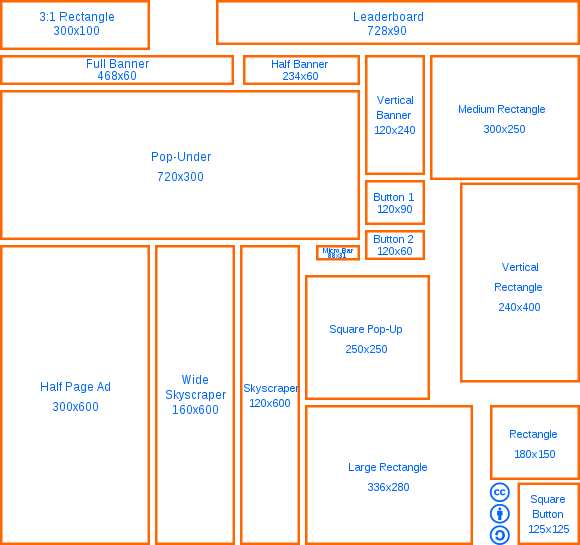 These three sizes are the most basic one used by advertiser and thus publishers maintaining these sizes usually ..
Just to give you the virtual view of all the Ad sizes you can refer the below image uploaded by WIKI..
Im a graphic design for over 12 years here and abroad.. I want to join and for for an online job making ads or advertisement and earn extra income by designing. How can i join such group. Kindly email me at edvillafuerte@gmail.com. Thank you. Hi, what does IAB stand for? I am in the process of developing an “Advertisement Rate Card” for my Blog and this information has been very helpful. After studying the various dimensions here, one conclusion I have come to as a startup is that, you mustn’t offer all the dimensions at the beginning or what do you think? Yes obviously. The strategy of specific offering goes much better than giving everything. But the selection should be according to the site look and feel. Hello, my name is Kate and I represent HYCM, a leading Forex broker. We are looking for high-quality Forex traffic from different GEOs. We work on Lot Rebate, CPA and Revenue Share. Please, feel free to contact me in Skype: kate201232 for additional information.